All of these birds look like small gulls. All of these birds are also about the same size and shape. The keys to identifying small gulls include bill size and color, mantle color, leg color, and head pattern. All of the small gulls that occur in Illinois, save one, have conspicuous dark hoods in alternate plumage, so we can conclude that these birds are not in alternate plumage. We can also conclude that all of these birds are adults (except for one) since all show evenly gray upperparts. We'll deal with the adult birds first. Laughing and Franklin's Gulls both have darker mantles than any of the birds in our group, as well as heavier bills. Sabine's Gulls are also darker backed and have a yellow tipped bill. Gull mantle color can change depending on the angle between observer and bird, but the mantle color of our birds appears to be about the same shade of gray as the mantle color of an adult Ring-billed Gull, which is at the paler end of the gull mantle color spectrum. Moving on, Little Gulls would have a prominent dark cap in basic plumage. A couple of the birds in the photo have a suggestion of a dark cap but nothing that comes close to the striking, well-defined skull cap of a basic plumaged Little Gull. Black-legged Kittiwakes have blackish legs and yellow bills. Ross's Gull would have a shorter bill and gray outer primaries. Note that the folded primaries of our birds, at least the primaries of the birds we can see, are dark. This pattern is found on two of our small gulls, namely Black-headed and Bonaparte's. Black-headed is the larger of the two, and in direct comparison this size difference is noticeable, but since all of the gulls in our group are the same size, the size difference between these two species is useless. We can see that the bills of the birds whose heads aren't turned away are black. Bonaparte's Gulls in all adult plumages have black bills while Black-headed Gulls in all adult plumages have reddish bills. Also note the grayish wash on the necks of these birds which is typical of basic plumaged Bonaparte's Gulls. What about the bird on the far right with the dark markings on its wings, and what about the birds in the back that are turned away? How do we know these are Bonaparte's Gulls? The bird on the far right with the dark markings on its wings is obviously not an adult. This bird is in its first plumage cycle and we know it's a Bonaparte's Gull because it's similar in size and shape to the positively identified Bonaparte's in the photo and because of the black bill. The birds whose heads are turned away are more problematic but they appear to be the same size as the positively identified Bonaparte's, and they all have the previously mentioned grayish wash on their necks as well. 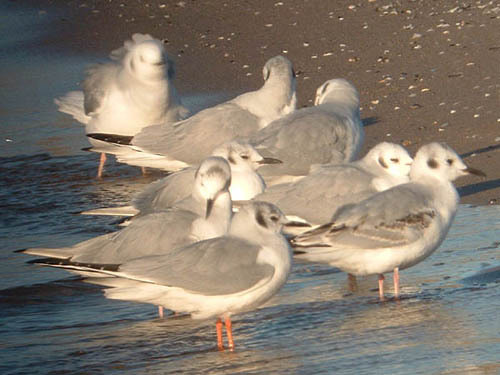 This group of Bonaparte's Gulls was photographed on Novemebr 14, 2004 in Racine County, Wisconsin.